I don’t know about you, but my heart just broke for Tiffany Foster this weekend. The Canadian rider had her Olympic dreams dashed earlier this year when some controversially stringent health exams disqualified her horse Victor from further competition. Then this weekend, at the BMO Nation’s Cup at Spruce Meadows, she and Victor went down hard, crashing through the second gate of a complicated double jump. Neither Tiffany nor Victor were hurt, but when it came time to make a second go of the course, Victor was having nothing to do with that jump. He refused twice, and it was all done for Tiffany. She left the ring on foot, leading Victor, and you could just see the effort it took to maintain her composure until she was out of the public spotlight. 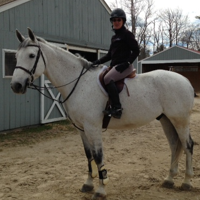 Sometimes, showing horses is wonderful and eventing is a dream come true. Some days aren’t so great. That’s why there’s retail therapy. I don’t know what Tiffany is doing to feel better, but if it was me? I’d be doing some serious shopping. A really rotten day deserves a serious pick me up. Check out these 14K Gold Horsehead Rings. They come in white or yellow gold, with sapphire eyes and .16ctw of diamonds arranged around a center ring. The styling is fabulous: finely detailed with a dynamic energy that attracts the eye and gets lots of compliments. 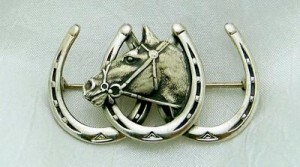 Slightly more affordable, but still great to lift the mood after a tough day in the show ring, office, or just in general, this sterling silver horseshoes and horsehead pin is a charmer. It’s a substantial pin, 1 1/2″ long by 1″ wide, and finely detailed. It’s a great piece of antique horse jewelry. If the world’s treating you badly, treat yourself well! Tomorrow’s another day – and you might as well look fabulous today!